Until recent times, amputation was a surgeon’s only treatment option for seriously injured or diseased limbs. 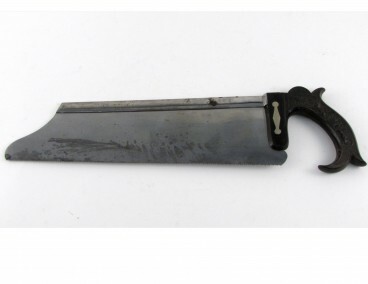 This instrument here is described as a tenon saw with an ‘English’ handle. Beginning in the late 18th century, tenon saws became more popular for amputations in England and North America than the older style bow saw (similar to a hack saw) favoured in Europe. An amputation saw was standard equipment in a surgical amputation kit. Also included could be a tourniquet to control haemorrhage, a catlin or small double-edged knife for cutting between bones at the joints before sawing, amputation knives of various sizes, a tenaculum for elevating blood vessels before tying them off, a means to open the scull such as a drill (trephine) or saw (Hey’s saw), and a lenticular for pressing the brain surface away from the trephined hole). The markings on this saw indicate that instrument maker W. & H. Hutchinson of Sheffield, England held an appointment to produce surgical equipment for the British Royal Navy. On board ship, the surgical amphitheatre was the cockpit below the decks and near the water line. Although it was removed from the confusion of battle, it was a poorly ventilated and poorly lit area and subject to the constant movement of the sea. Aboard ship, amputations, extraction of foreign bodies, and the stabilization of fractures were basic surgical procedures. Amputations were common. Lord Horatio Nelson (1758-1805) is perhaps the Royal Navy’s best known amputee: Nelson lost his right arm the sight in his right eye as a result of battle injuries.